Tunde Odunlade is a multi-disciplinary artist with a unique specialty in textile work. He has exhibited and lectured extensively within Nigeria, throughout Africa, North America, and Europe. His works are featured in the collections of the Smithsonian Museum of African Art, the Victoria and Albert Museum in London, the State House in Lagos, Nigeria and many other equally notable institutions. He is a member of the infamous Oshogbo School of Art, which was a movement that set Nigeria onto the international art stage in the early 1960’s. 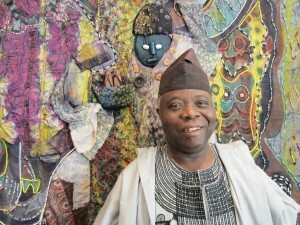 His work draws heavily on the rich traditions and histories of Yorùbá culture and religion. As an advocate for peace and universal disarmament, Odunlade uses his work for creating the change he wishes to see in the world.